Probably the second most common shape of a steel pen, besides the plain, straight pen, is the Falcon. The origin of the Falcon, and how it got it’s name, is up for debate. But in the US, at least, it seems that the Esterbrook Steel Pen Co. was the King of the Falcons. The shape isn’t mentioned by name by any earlier US pen makers, but it was one of the first pens Esterbrook made. And for most of the company’s existence, the 048 Falcon was the top selling pen of any style for any US maker. It became the symbol of the company, second only to R. Esterbrook’s signature. Most falcons come in a standard size well-represented by the Esterbrook 048 Falcon. The 048 is the only number of Esterbrook’s which includes (and always includes) a zero at the beginning of the number. It is not a #48, it is a #048. Esterbrook, as well as others, also often made a “Ladies’ Falcon” in the form of a small falcon. The more delicate, and sometimes more flexible, falcon was deemed suitable for the delicate pens with which delicate ladies wrote delicate letters delicately. At the other end of the spectrum is Esterbrook’s Mammoth Falcon. This behemoth requires a special holder and seems better suited to small-scale gardening than to writing. Here’s a photo of the two most common sizes of Falcon plus the Mammoth Falcon. The Lady Falcon at the top was made by Leon Isaacs. Esterbrook also made a medium sized Falcon that fell somewhere between the 048 and the Mammoth. 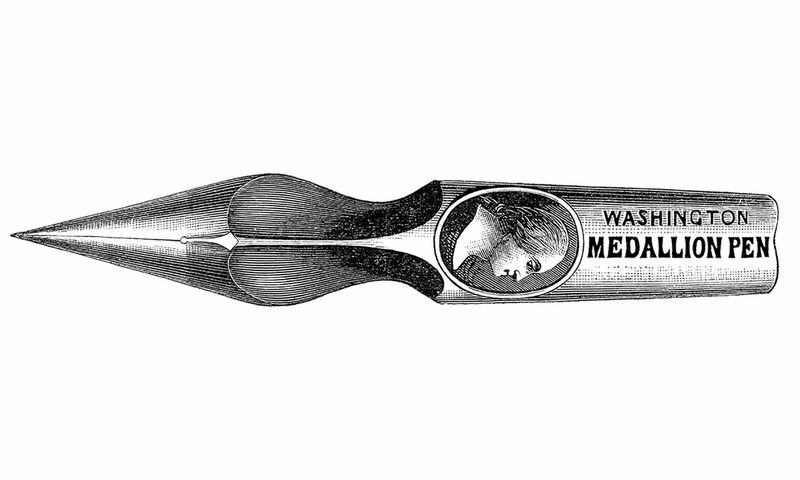 This was called the #491 Madison Pen and was introduced in 1891, ten years after the Mammoth Falcon. I’ve never seen one, nor is one available on The Esterbrook Project. They only appear in one of the catalogs and may have been produced for only a limited time. A wide assortment of businesses wanted falcons among their special imprinted pens: Bell Systems, Burlington Route (Esterbrook 048’s), Commonwealth of Massachusetts (Esterbrook 048’s), Hotel Belmont, Lehigh Valley Rail Road, New York Central, Pennsylvania Railroad, Santa Fe Railroad and Western Union, to name a few. The Esterbrook Project is just what it sounds like, a site dedicated to all things related to Esterbrook steel pens. This deceptively modest site began as the owner, Phil, needing to come up with a way of keeping track of his own collection. After losing the information a couple of times, and having to start over, he decided a web site would be the best way to store the information. Now The Esterbrook Project has the largest collection of images of Esterbrook steel pens in the world. Phil has carefully and conscientiously gather nibs, many from his own collection, others donated to add to the repository, taken careful photos and captured evidence for the existence of these nibs. He’s listed different sources that reference the nibs, such as the different Esterbrook catalogs which are known. The heart of the site is the Nib List. This is where you can take any Esterbrook nib and look it up by number. There are fewer and fewer numbers with no photos as the site becomes more popular and people send in missing nibs. Phil is very careful and will return the nib if asked, but if you can, I recommend gifting him an example so he can add to his collection as well as add it to the site. It’s a small price to pay for such an amazing resource. There are some other resources on the site, including Phil’s own diagram of a pen’s anatomy. Reviewing it for this post reminds me that I forgot “shoulder” for my diagram. [now fixed, ed.] See, there’s always something else to learn at The Esterbrook Project. Full disclosure here, I have helped Phil out with the site from time to time and I’m fully dedicated to keeping this amazing resource going as long as we can.